I read this article and found it very interesting, thought it might be something for you. The article is called Half Full, Half Empty: 10 Years of NREGA and is located at https://archive.indiaspend.com/cover-story/half-full-half-empty-10-years-of-nrega-80147. Workers from a dalit hamlet in Tamil Nadu’s Villipuram district building a road to a cremation ground on the outskirts of the village as part of the rural jobs programme, National Rural Employment Guarantee Act (NREGA). 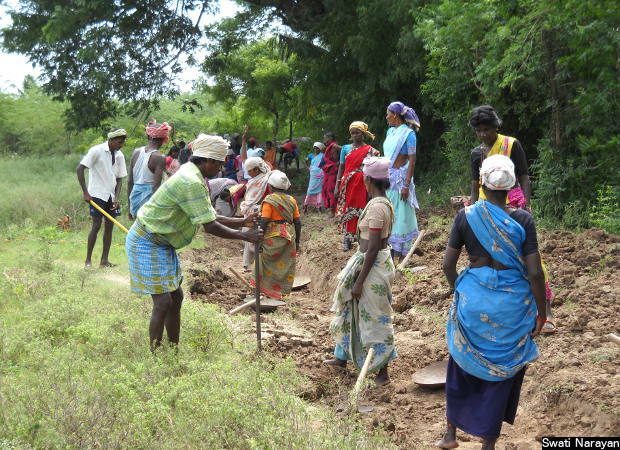 As many as 86% of NREGA workers in Tamil Nadu are women. The fruits of a people’s movement and the world’s largest anti-poverty public works, the National Rural Employment Guarantee Act (NREGA) last year provided employment to 22% of all rural homes. At its peak five years ago, it was a lifeline for 55 million, or one in every three rural homes. But it has yet to expand to its full potential. Up to 70% of interested poor households did not receive any NREGA work between 2004-05 and 2011-12, reports the India Human Development Survey 2 (IHDS2). Unemployment allowance, stipulated in the law, has also rarely been paid as a substitute. Nevertheless, for recipient families, 32% of their poverty decline comes from NREGA alone, according to IHDS2. Under the law, promulgated in 2005, each household is guaranteed 100 days of work every year. But, on average, each NREGA household received only 45 days of work over the last decade–less than half the guarantee. The lowest average was last year: 38 days. Uttar Pradesh and West Bengal clocked in even less. So, it is ironic that recently the Central government has expanded the guarantee to 150 days of work in 14 drought-affected states. Odisha further increased the cap to 200 days. But this does not work as a drought-relief measure, as only 4% of employed households hit the 100-day mark last year. At its peak, too, only 14% have ever received 100 days of work. Worse, the total nationwide person-days–a measure of NREGA employment–almost halved in 2014-15 (1.49 billion), compared to its peak five years ago (2.84 billion). The law also stipulates that wages are to be paid within 15 days. Last year, 72% of wages were delayed. This year, no more than 45% of wages have been paid on time. In the midst of a drought, villagers who survive hand-to-mouth cannot afford to wait. Compensation for delayed payment is also rare. In several states, such as Kerala, Andhra Pradesh, Karnataka and Rajasthan, NREGA wages are lower than the minimum wages for unskilled agricultural work, which makes it difficult to attract workers, especially the youth, who often prefer to migrate to urban areas. Yet, this safety net has bolstered their bargaining power even on distant shores, as scores of Bihari migrants will testify. On a more positive front, 40% of households employed under the law are impoverished dalits and adivasis, even without any explicit targeting. The IDHS2 attributes 38% and 28% of reduction in poverty in employed dalit and adivasi (tribal) homes, respectively, to NREGA alone. As importantly, in India’s patriarchal society, the NREGA has emerged as a torchbearer for women’s empowerment. As many as 55% NREGA workers in 2014-15 were women, and their participation has soared 38% over the last decade. Predictably (since they are states with high female literacy and social emancipation), Kerala and Tamil Nadu top the charts, with as many as 92% and 86% of NREGA workers being women. Even before the Jan Dhan Yojana, the NREGA had opened 100 million bank accounts, often used by women for their wages, often for the first time, and on par with men. Note: In 2006-7 NREGA was applicable in only 200 backward districts, in 2007-08, it was extended to 330 districts, and, from 2008-09, implemented across India. There has also been much hand-wringing about the quality of NREGA work. A deeper look reveals that 28% of works, even in 2013-14, were to improve rural sanitation, even before the Swachh Bharat Abhiyan. Another 30% were for water conservation, flood control, drought proofing and micro-irrigation. More than half the works were “green jobs” directly related to improving agricultural productivity. For example, the Institute for Human Development shows a high completion rate, with a 6% rate of return for about 100,000 wells sanctioned in Jharkhand. The Maharashtra government’s Jalyukt Shivar Abhiyan to make 5,000 villages drought-free also depends on the NREGA. In another ingenious initiative, Tamil Nadu has employed 60,000 Thuimai Kavalars (sanitation workers) under NREGA across three-fourth of villages. In Karnataka, NREGA workers have even been employed to manufacture environment-friendly earthen bricks. These tasks are a far cry from digging and filling trenches. Despite the Prime Minister’s mockery of the lifeline in Parliament last year, the Bharatiya Janata Party, at the 10th anniversary celebration of NREGA, hailed it as the nation’s “pride”. Workers at an urban employment guarantee worksite in a slum of Tripura’s capital, Agartala. With the tide turning in favour of the state’s pilot urban-jobs programme, an argument is being made for its nationwide replication. 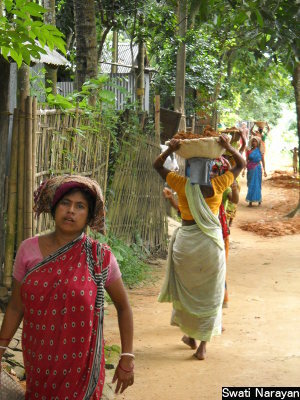 Tripura is the only state to offer urban dwellers guaranteed employment. With the tide turning, the clamour has now begun for its nationwide replication. The next decade holds much promise for the right to work.